Blade Guides – Roller or Ceramic? Blade guides come in two basic designs—block guides (usually ceramic) and roller guides. If you’ve been on any sawmill forums, such as Norwood’s “Sawmill Connect”, you have no doubt seen a lively discussion and debate over the relative merits. First, I want to clear up the common misconception that those sawmills that come with block guides cut corners to keep the cost down. A well-designed block guide system requires the mill band wheels to be perfectly balanced and aligned. They have no moving parts and, in theory, only touch the blade when the blade tries to wander in the cut, or the blade has enough feed pressure to push it against the back block. Ceramic guides work well, as long as you keep them adjusted. If you are a “set it and forget it” person, or operating a production mill with wider blades and power feed, roller guides may be a better choice. Roller guides, on the other hand, put between 1/8” to 1/4” downward deflection on the blade which holds the blade steady. Both the fixed guide and the movable guide must be set to the same deflection to get a perfectly level cut, and the movable guide has to maintain the same deflection all along its motion of travel. They roll on bearings which can seize up, wearing a flat spot on the roller, which must then be replaced. 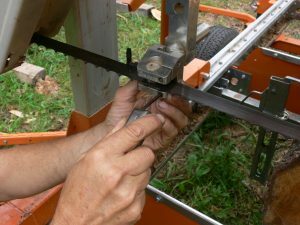 Those who prefer roller guides like the fact that once they are properly set up, they cut true with no need for adjustment after each blade change. The shoulder on the rollers keeps the blade from moving back on the band wheels when applying heavy feed pressure, making them popular on high production outfits that push the mill and blade to their limits. Those in the block guide camp (including me) typically run small manual sawmills of 25 horsepower or less and, since we push the blade by hand, we don’t apply heavy feed pressure that would push the blade back on the band wheel, though there is a backing block, just in case. The blocks do require a little more attention than the roller guides. This typically involves turning the band wheel by hand after each blade change and listening for any indication that the blade is scraping a block. The blocks can get knocked out of alignment if they get pushed against the log, but adjustment is quick and easy. Adjusting the blade angle parallel to the track is a matter of setting the tracking. Moving it back on the band wheels tips the blade down slightly, and moving it forward tips it up, so correcting for a blade that dives or climbs is easy, once you get a feel for it. A second advantage of the guide blocks is that they can be removed altogether to get an extra wide cut for slabs without affecting the blade height. Like a lot of aspects of running a sawmill, you may have to experiment to find what works best for you and the lumber you cut. My advice is to start out with the guide system that comes standard on the mill, and make a change if you find that it just doesn’t work as well as you think it should. Meanwhile, read up on the experiences of other sawyers, and don’t be shy about asking questions. What guides to they prefer and why? What options do they find most useful? Are there little modifications that make the mill run better? Most of us like nothing better than to help a new sawyer or “wannabe” sawyer enjoy making sawdust as much as we do!